There’s no such thing as an easy move, especially when it comes to packing up the kitchen. With so many small, fragile and potentially dangerous objects, the only room that comes close to the kitchen’s complexity is perhaps the bathroom. But you can make lighter work of the job with a few simple tips. You won’t need expensive tools. And the supplies are cheap or even free. So instead of leaving the kitchen for last, get started today and put this room behind you. Liquor stores have some of the sturdiest packing boxes available. Even better, they’re usually free for the asking. But probably the best feature of liquor boxes is the pre-compartmentalized interior. Tuck kitchen glassware and other breakables into the divided sections. You won’t need much, if any, additional padding. Wrapping each dinner plate in bubble wrap or newspaper takes too much time, and it also uses a lot of carton space. Separate and protect dishes in one step with foam plates. Foam dinnerware is also available in odd sizes such as saucers and bowls. And if you turn foam bowls upside down to line a moving box, you’ll create a cushion that’s lightweight. Anyone who has moved more than once has probably left something important behind. Avoid this by beginning at one end of the room and working your way around. 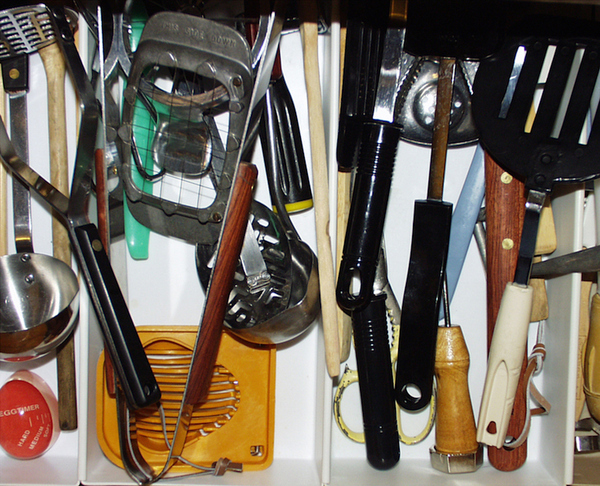 Leave cabinet doors and drawers open once they’re packed. You can see at a glance when you’re done. If your kitchen is too small, use a tagging method. Removable sticky notes on door and drawer fronts indicate which parts of the kitchen are packed. Hollow pool noodles or foam floaties are cheap if you shop at a discount store. Cut them into shorter lengths, and you’ve got perfectly padded packing materials for protecting sharp and fragile items. Tuck kitchen cutlery inside a pool noodle section and tape the ends closed. You can also use sections to pack smaller, fragile bottles such as oils and spices. Slice the foam sections to make small pads that fit around anything. Ordinary plastic wrap turns this jumble into a tidy bundle. What’s the easiest way to lose some of your flatware or silverware? Wrap the pieces individually. Instead, pull out the whole flatware tray and wrap it in kitchen plastic wrap. Everything will be in its place when you unpack. If you’re concerned about flatware jostling around in the move, pull each group of flatware from the tray, wrap it in plastic wrap and put it back. Then wrap the whole tray. Visit moverjunction.com and find professional, experienced movers who will handle your kitchen with care. No matter how carefully you pack up the kitchen, it can still take valuable time to locate essentials at your new home. Make a “first-day” box, and you’ll have everything that you need. Coffee or tea drinkers might need a coffee pot, kettle, mugs, coffee or tea, and condiments such as non-dairy creamer and sugar. You might also want bowls, spoons and nonperishable breakfast items handy. No matter how carefully you clean and dry a coffee pot or tea kettle, some water almost always remains inside. Pad the interior of the water reservoir with a dish towel. You’ll soak up water and avoid chalky mineral deposits left behind. Caveat: Many Keurig and similar coffee pots can’t be drained before a move. Wrap them in absorbent towels in case of leaks. Bouncing isn’t as much of an issue in a short move, but long-distance moves can subject small appliances to a lot of abuse. Tape lids and doors shut to prevent damage. And don’t forget to remove the microwave tray. Tape can leave a sticky residue, but it’s easy to remove. Skip the soap and alcohol. Either cooking oil or mineral oil on a cotton ball will dissolve and remove tape residue much more quickly. Kitchens seem to take forever to pack. There are so many different types of items, and most of them require special attention. But if you break from tradition and leave the stacks of newspaper behind, you can save space and protect your belongings much better. One final hint: If you must pack flour, sugar and similar foods, do yourself a favor. Store them, bags and all, inside sealable plastic kitchen storage containers. Even if the bags break, they won’t make a mess. Ready to find a mover and further simplify your life? You’ve in the right place. Get a moving quote from Mover Junction and let someone else handle the heavy lifting.